This thing is HUGE - you'll have to kick all the other pillows off to the side of the bed - and it's softer than I expected, but it is supportive and does the job. This ultra-supportive down alternative wedge pillow offers the utmost comfort and quality and is an essential product for people looking to get a good nights sleep. 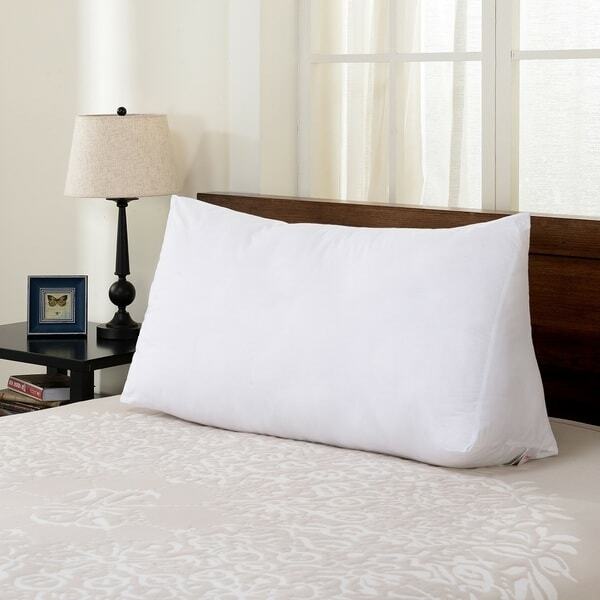 The gentle sloping wedge shape of this pillow aids in reducing acid relux while sleeping or resting. Love this pillow! It is great for reading in bed. What you get and what the picure looks like are two different things. It actually looks like a body pillow that bends in the middle. I think it was misrepsented in the picture. I will try it tonight but I think I my return. It is not as firm as I would of liked - but it does work great and you can use it for many types of things. "Does this come with a pillow case?" This does not include a pillow case. Just purchased a day bed, and no one could meet your price and guality. "What are the dimensions of this pillow?"